Just two weeks after taking down the 2014 PokerStars Caribbean Adventure $10,300 no-limit hold’em main event for more than $1.4 million and 2,400 POY points Dominik Panka found a way to come out on top in yet another huge event. This time the 22-year-old from Poland won the 2014 EPT Deauville €10,300 no-limit hold’em high roller, earning another $371,498 and 600 more POY points, putting him 900 points ahead of second-place occupant Mike McDonald. A total of 115 entrants turned out for the eight-handed high roller tournament, building a prize pool of $1,507,847 USD. Joining Panka at the final table were Kent Lundmark and Davidi Kitai. 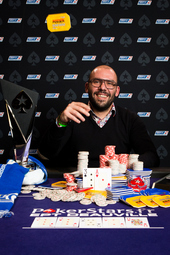 Sotirios Koutoupas has emerged victorious in the 2014 European Poker Tour Deauville €5,300 no-limit hold’em main event, taking home the €614,000 ($839,670) first-place prize and earning 1,680 POY points, which catapulted him into third place in the overall race standings. In addition to the money and the ranking points, Koutoupas also earned the distinction of becoming the first-ever Greek EPT main event champion after topping the field of 671 entrants. Koutoupas wasn’t the only player looking to get his name in the poker history books at this final table, however. Eugene Katchalov had the opportunity to become the sixth player in the world to ever win poker’s triple crown, capturing at least one WSOP bracelet along with WPT and EPT main event titles. Katchalov won his bracelet in a $1,500 seven card stud event at the WSOP and also took down the 2007 WPT Doyle Brunson Classic main event, but fell just short of earning the triple crown in this event when he eventually was eliminated as the runner-up. 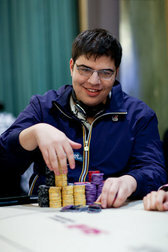 Katchalov climbed to eighth place in the POY race standings as a result of his deep run, earning 1,400 points in addition to the $518,981 in prize money that came with his second-place finish. 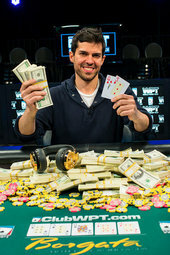 Anthony Merulla topped a gigantic field of 1,229 entrants in the 2014 World Poker Tour Borgata Winter Poker Open $3,500 no-limit hold’em main event, earning $842,379 and 1,440POY points for the win. As a result the 39-year-old financial professional climbed to sixth place in the overall standings. This event featured a $3 million guarantee which was blown away when the strong turnout built a final prize pool of $4,055,700. The lion’s share went to Merulla, who topped a tough final table that featured the likes of Jared Jaffe (4th – $258,590) and eventual runner-up David Paredes (2nd – $499,549). Paredes also scored 1,200 points for his finish, climbing to 11th place in the POY standings as a result. The 2014 APPT Aussie Millions kicked off in late January, and although some of it’s biggest events have yet to finish, it has already made it’s impact felt on the POY race. The most notable beneficiary of the prelims in Melbourne has been Mustapha Kanit, who topped a field of 1,302 entrants in the $1,100 AUD buy-in no-limit hold’em kick off event. Kanit won $172,000 and 480 points and then hopped right into event no. 4, $1,100 AUD buy-in six-max no-limit hold’em event. Again he emerged victorious, this time earning $91,416 and 360 more points. Kanit had already finished fourth in the $25,000 no-limit high roller at the 2014 PokerStars Caribbean Adventure, and as a result of these three scores he has climbed into fifth place in the POY standings, with 1,554 points and year-to-date earnings of $756,016.